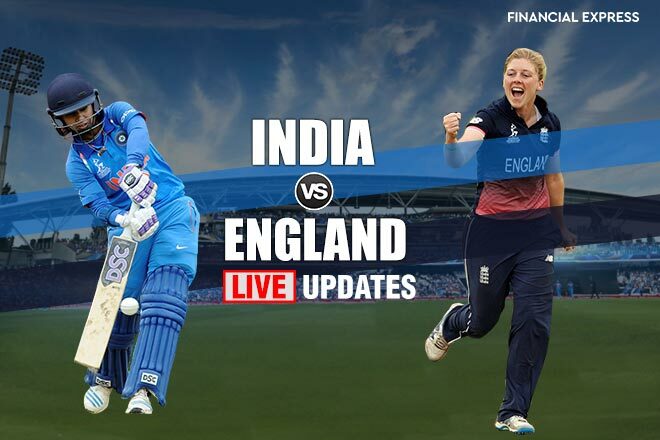 India vs England Final, LIVE Cricket Score: After winning the toss and deciding to bat first, the England women’s cricket team got off to a good start. They set the target of 229 runs for India to win. In reply, India started badly with opener Smriti Mandhana out for a duck. Next to go was skipper Mithali Raj, who was run out for 17 runs, leaving India struggling at 43/2 at that stage. After this India’s latest batting sensation Harmanpreet Kaur and Raut steadies India innings putting in more than 50 runs partnership, before the former was dismissed for 51 runs. Team India which at one stage looked to win comfortably lost the final by 9 runs with 8 balls to spare. Earlier, after winning the toss, Natalie Sciver and Sarah Taylor put on 83 runs partnership for the fourth wicket to help hosts put up a challenging total on board for India. Openers Tammy Beaumont and Lauren Winfield had provided seady start to England before the first wicket fall on 47 runs. Even as Indian spinners contained run rates, Beaumont’went for a full before the ball landed straight into the hands of Goswami. Soon England was 63/3 after Knight was declared LBW. However Taylor departed soon after, fiver runs shot of her half century, after cliping a Goswami delivery into the hands of wicketkeeper Sushma Verma. The bowler stuck again in her next delivery surprising Fran Wilson with an yorker to send her back to the pevilion. Sciver, who is one of stars of Enland’s batting line up and only batter to score two centuries, reached 50 runs mark, but after adding just one run she was was trapped by Goswami. Another batwoman Katherine Brunts, who also showed some resistance was run out when she was on 34 runs. Jenny Gunn also did a reasonable good job to stay unbeaten at 25 runs and give the England something to defend in the final. 10:50 PM: As per cricinfo.com, Mithali Raj has confirmed of playing for few more years. 10:45 PM: England have won their fourth World Cup title. Anya Shrubsole took six wickets tohelp her side clinch nine-run victory over India. At one stage, the home side was in danger of losing the final, but an astonishing spell by her turned thinga around for hosts. 10:40 PM: England team celebrate after lifting the World Cup. Gets ready for a team photo with the trophy. 10: 35 PM: Congratulate team. They have achieved a milestone, now everyone would see them with great respect,”BCCI acting president CK Khanna told ANI. 10:25 PM: Team India and Team England players get their momentos. 10:20 PM: Award ceremony begins. Tammy Beaumongets player of the tournament award. She was the top scorer of the tournament. 10:10 PM: The defeat was no doubt setback, but fans should not loss heart. Indian team played really well to reach this far. In the final too , they lost just by 9 runs. 10:05 PM OUT: India lost their tenth wicket and also the final. Rajeshwari Gayakwad goes for duck. 9:59 PM OUT: Shikha out. India at 218/8. Poonam Yadav has come out to the crease. 9:30 PM OUT: Raut gone. India 191/4 in 43 overs. 9:20 PM: Raut still going steady. She is on 77 runs of 106 deliveries. Team India now 59 runs away from lifting the World Cup, with 7 wickets in hand. 9:15 PM: Punjab Chief Minister today announced cash prize of Rs 5,00,000 for Harmanpreet Kaur for her performance in the semi-final. He conveyed this to her father, Harmandar Singh, whom he called up to congratulate, an official spokesperson said, as per PTI. 9:01 PM: Earlier, in big morale booster, Indian Women’s Cricket team got a special ‘best of luck’ message from PM Narendra Modi as the latter wished all the team members one by one in series of tweets. “As our women’s cricket team plays the World Cup finals today, I join the 125 crore Indians in wishing them the very best!” Modi said in his first tweet. The PM then wished all the team members one by one. 8:44 PM: Team India seems to be in drivers seat now. Raut batting at 63 runs, while Kaur is at 51. India 138/2 in 33.2 overs. 8:14 PM: In 24 overs, Team India has reached 88/2. Kaur batting at 30, while Raut batting at 37 runs. 7:52 PM: Both batters added 11 runs in last 5 overs. Still a long way to go. 7:44 PM: After 16 overs Team India 50/2. Raut batting at 24, while India’s lastest batting sensation Harmanpreet Kaur batting at 6. 7:33 PM: OUT: Mithali Raj run out for 17. Team India 43/2 in 12. 5 overs. 7:24 PM: Team India reach 31/1 in 10 overs. In last 5 overs, Team India scored 16 runs without losing any wicket, with an average of 3.42 against required run rate of 4.8. 7:12 PM: After fall of first wicket, both batters playing cautiously.Team India 24/1 in 7 overs. 7:07 PM: After 5.1 overs, Team India 19/1. Raj batting at 7, Raut at 10 runs. 6:58 PM: Skipper Mithali Raj at the crease. 6:54 PM: First India wicket falls. Mandhana out on a duck. 6:46 PM: Team India has come out to bat. Openers Punam Raut and Smriti Mandhana at the crease. 6:44 PM: Earlier in the day, fans across the globe including PM Narendra Modi wished the team good luck. 6:34 PM: Team India is all set to bat soon. All eyes will be on their reply to the England’s total. 6:24 PM: Excellent Over! Brilliant stuff from Deepti Sharma, just 6 runs from the last over. This means the target for India will be 229 runs. 6:14 PM: Interesting choice, spinner Deepti Sharma will bowl the last over for India. The score after 49 overs is 222/7. 6:06 PM: 200 up for England in the 47th over. How many more can they score in the last 3 overs? 6:03 PM: OUT! Another one for the Indian cricket team! This time it was the result of a brilliant piece of fielding by Deepti Sharma. Burnt is run out for 34. 5:52 PM: The match is evenly poised at the moment despite Jhulan Goswami’s good spell. The score is 182/6 after 43.3 overs. 5:42 PM: Jhulan Goswami has finished her spell with the figures of 23/3 from 10 overs. This could well be her last match in a World Cup competition. 5:30 PM: OUT! Another one goes and it’s once again Jhulan Goswami who struck. That’s her third wicket. 5:23 PM: Shikha Pandey is back into the attack for her fifth over and you could sense that it has to do a lot with Jhulan Goswami’s success. Meanwhile, Natalie Sciver has reached her half-century. 5:10 PM: What an over from Jhulan Goswami. Two wickets for her in two balls. She has pushed England on backfoot. 5:00 PM: Both the England batswoman are countering the spin really well here. Sarah Taylor is using her feet well to rotate the strike. Mithali Raj needs to do something different. 4:45 PM: GOOD NEWS! The rain is almost gone. but, England is looking good at this moment. The score is 133/2 after 30 overs. 4:45 PM: The partnership between Sarah Taylor and Natalie Sciver is of 51 runs now. The rain has slowed down a bit. England is recovering well at the moment. 4:42 PM: It’s been raining heavily for a while but the umpires haven’t stopped the game yet. Shikha Pandey has been introduced into the attack by Mithali Raj. 4:34 PM: FOUR! Natalie Sciver swept that away for a beautiful four. That was bowled on legs by Haramanpreet Kaur and Sciver made the best use of it. 4:30 PM: BAD NEWS! It has started to rain at the Lord’s. Right now the rain is not too heavy and we hope that it stops soon. 4:06 PM: OUT! Another wicket for India. England captain Heather Knight departs for just 1 run. This is turning out to be a great comeback by the Indian spinners. 4:05 PM: Indian bowlers have made a spirited comeback after the openers gave England a strong start. The score is 63/2 after 16 overs. 3:55 PM: FOUR! Good stroke by Tammy Beaumont. Pierced the gap beautifully. The score moves on to 59/1 at the end of 14th over. 3:45 PM: OUT! GONE! BOWLED! by Rajeshwari. That’s the first wicket, India needed it desperately. Lauren Winfield departs after 24 runs. She was looking good but Gayakwad got the better off her. 3:08 PM: First three overs have been expensive from the Indian bowlers. England has raced its way to 15/0 after 3 overs. 3:00 PM: The England openers are out in the middle. Lauren Winfield will open the batting with Tammy Beaumont. Jhulan Goswami to start for India. England Women – Lauren Winfield, Tammy Beaumont, Sarah Taylor(w), Heather Knight(c), Natalie Sciver, Fran Wilson, Katherine Brunt, Jenny Gunn, Laura Marsh, Anya Shrubsole, Alex Hartley. India Women – Smriti Mandhana, Punam Raut, Mithali Raj(c), Harmanpreet Kaur, Deepti Sharma, Veda Krishnamurthy, Sushma Verma(w), Jhulan Goswami, Shikha Pandey, Rajeshwari Gayakwad, Poonam Yadav.